A few weeks ago, my aunt visited us with her special homemade Pidi and Kozhi Curry. As soon as I tasted her Pidi and Chicken Curry, I knew I had to ask her for the recipe. It was simply awesome and hubby raved about it. Pidi is a traditional Kerala dish (which has Knanaya origins). It is something like a Rice Dumpling. 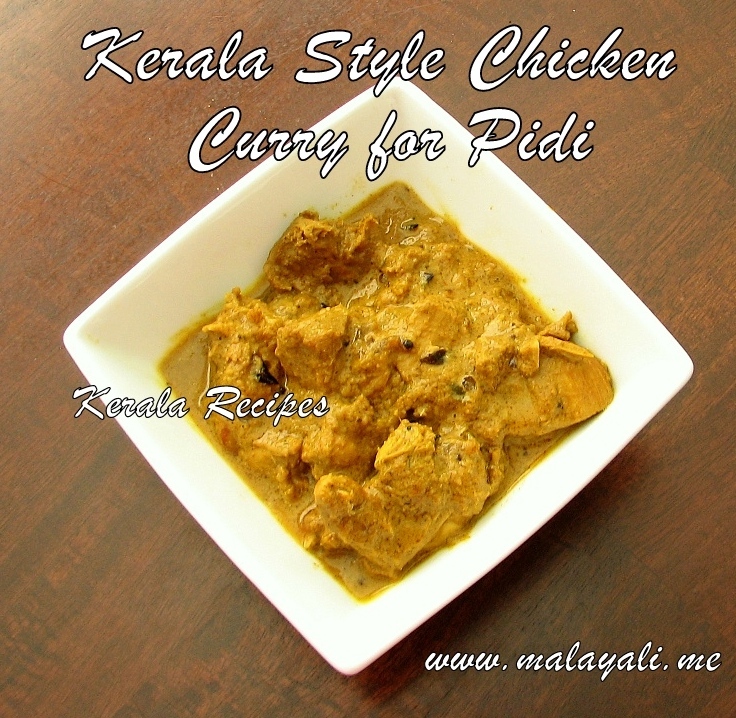 Pidi is always accompanied by a Kerala Style Chicken Curry. Chicken Curry can be made in so many different ways but my aunt’s Chicken Curry had a rich gravy and it paired so well with the Pidi. Here is the recipe for a Kerala Style Chicken Curry with a twist. This curry tastes awesome and it goes well with almost everything. Wash and clean the chicken thoroughly. Cut it into medium sized pieces. Soak it in water along with 1 tbsp lemon juice for 5 minutes. Drain and keep aside. Heat 3 tbsp oil in a big pan and saute onions. Throw in the curry leaves and continue sauteing until the onions begin to brown. This will take some time. Reduce heat and add the minced ginger and garlic. Saute on medium-low heat until the onions have browned. Add turmeric, coriander, chilly, chicken masala, black pepper and garam masala powders. Stir fry for a minute or two on low heat and remove from stove top. Allow it to cool. Once cooled, grind everything along with 2 tbsp water to form a smooth paste. Apply this paste on the chicken pieces and transfer everything back to the pan. Add salt to taste. Cover and cook the chicken for around 20-25 minutes stirring occasionally. The chicken will let out it’s own water as it gets cooked. If you need more gravy, you can add 1/2 to 1 cup of water. Reduce heat and add coconut milk. Open the pan and simmer the curry for 5 minutes so that the gravy thickens. Meanwhile, heat 1 tbsp oil in a frying pan and splutter mustard seeds. Add thinly sliced shallots and curry leaves. Saute for a few minutes until the shallots begin to brown. Add the chopped ginger and garlic and saute for a few minutes. Pour this seasoning over the chicken curry. Remove from heat and keep it covered. I tried this curry last weekend and we all loved it. We had it with Appam and it was superb.